2,850 is a key level for the S&P 500. We need to add more hedges if we're going to keep our longs on the table. 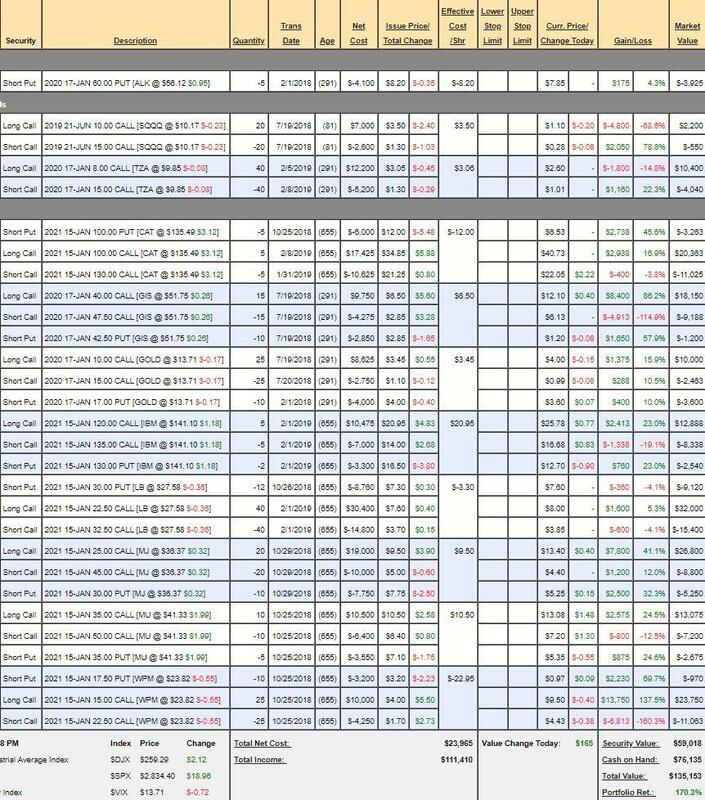 Notes on hedging and portfolio balancing. Over 2,850 on the S&P 500 (/ES). 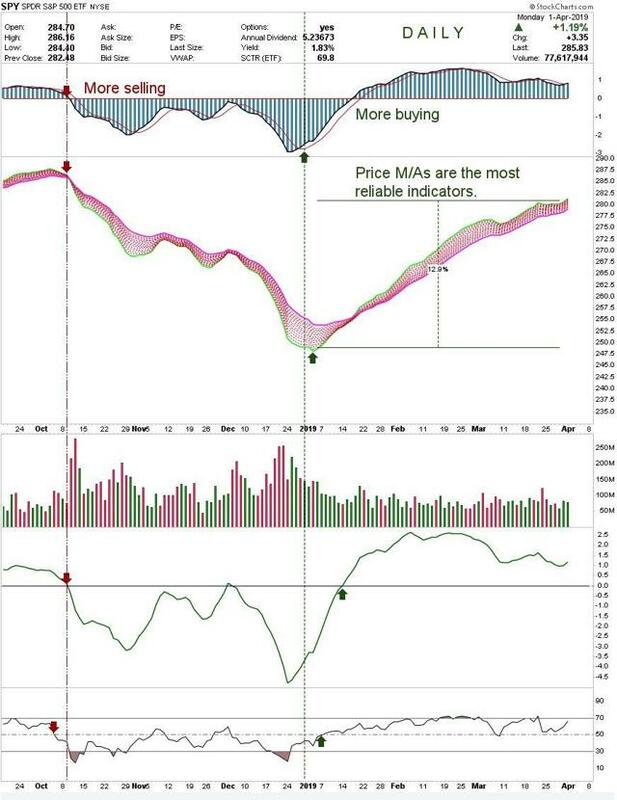 The S&P 500 is at 2,873, in fact, as of yesterday's close and I really liked this chart by Andrew Lais at Stockcharts on the SPY showing the huge turnaround in buying activity that has fueled what is now a 12.9% rally off the January lows. Clearly, sentiment could not be better and that may be the problem as we head into an earnings season that is almost certain to disappoint the bulls. On the other hand, if they are willing to consider Q1 a bump in the road, we may truly be off to the races if 2,850 firms up as a new bottom for the senior index. We have a light round of earnings this week but, just this morning, Walgreens (WBA) gave a disappointing report and promptly dropped 8% pre-market after reporting earnings of $1.64 vs the expected $1.72 and also cutting guidance for 2019 to flat to last year's $6/share in earnings, which makes the stock quite a bargain to me (we're long) and our 2021 target was only $62.50 anyway - so we don't mind a little pullback. In a trend that will challenge the sector, declining reimbursements for prescription drugs cut into the company's profit margins. While Walgreens is filling more prescriptions at the pharmacy counter, it’s making less money on them - a worrisome sign for a key part of the business. 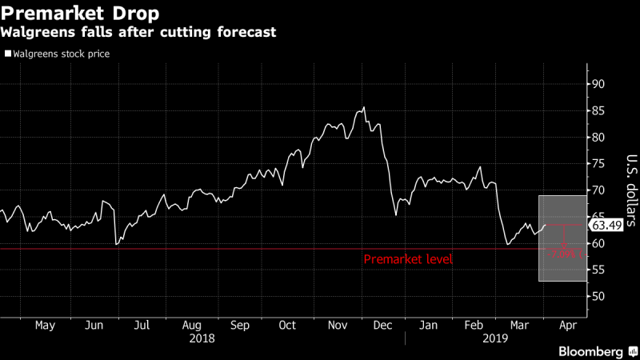 Prescription sales in its U.S. stores rose 9.8 percent in the second quarter, but gross profit at the pharmacies fell 3.2%. “The market challenges and macro trends we have been discussing for some time accelerated, resulting in the most difficult quarter we have had since the formation of Walgreens Boots Alliance,” Chief Executive Officer Stefano Pessina said in a statement about the quarter. While those problems may be unique to WAG, poor Q1 earnings will not be unique at all. And if investors are going to chop 8% off the price of a company for matching last year's earnings - then don't expect 2,850 to hold up on the S&P 500 as more and more earnings reports are revealed. 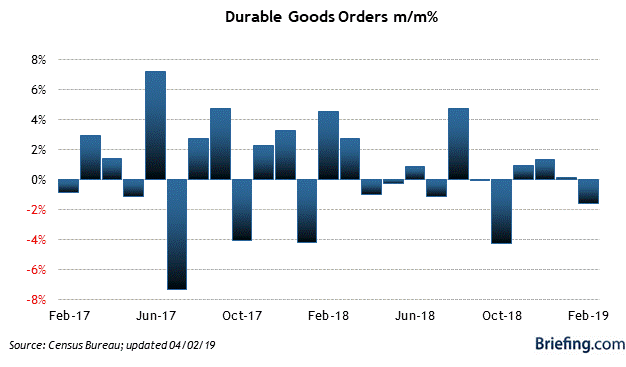 It's not just earnings that are a problem, we just got the Durable Goods Report and it wasn't good at all with a 1.6% dive in February while last month is revised down from 0.4% to 0.1%. And this doesn't even begin to reflect the disaster that March will be as Boeing was forced to halt shipping on their flagship 737 Max planes after two crashes - a problem that is still not resolved. I've concluded that the gains in our portfolios have gotten downright silly and that makes me uncomfortable as there's no way they can keep printing money at the rate they've been printing it during Q1. As noted in the chart above, some of that money flowed into the market but a lot if it flowed into the bond market, driving the long-term yield curves below the short-term rates - which is usually interpreted as a sign impending recession. Whether or not we have a recession, clearly the market is priced for no such thing ever happening so it should be no more surprising to see the whole S&P drop 10-15%, as it did in December, as it is to see it rise 12.9%, as it did in Q1. The best thing we can do, absent of cashing out, is to put about 25% of our unrealized gains into hedges and, fortunately, hedges are very very cheap right now. SQQQ and TZA are the primary hedges in our Short-Term Portfolio, whose primary purpose is to protect our Long-Term Portfolio in our paired portfolio strategy. At the moment, our hedges are fairly profitable and both are pretty much at the money but, with the SQQQs having gotten so much cheaper, it's going to be a good time to press that hedge. Since SQQQ is a 3x Ultra-Short ETF, if the Nasdaq drops 10%, SQQQ should rise 30% to about $13 and 20% down on QQQ should give us about $16 on SQQQ and that would make our 200 shares worth over $120,000 vs their current price of $36,500. There are two ways we can pump up this bet - we can double down, spending $36,500 more to buy $120,000 more protection (net $83,500) or we could roll the $10 calls down to the $5 calls for about $3 ($60,000), putting us $100,000 deeper in the money and effectively buying $100,000 for $60,000 rather than speculating with $36,500 to maybe make $83,500. While buying an actual asset (the lower calls) does appeal to me, this hedge is INSURANCE and we're rather get more protection for less money and take our lumps if the market goes higher, which means we'd expect to make additional gains in our LTP positions to offset the STP losses. So, officially, for the Short-Term Portfolio, let's double down on the SQQQ Jan $10 calls at $1.80 ($36,000) and buy back the short June calls to clear a slot for another sale if we get a nice pop. It's a lot easier to hedge your portfolios correctly if you know how much money they will win or lose in various market conditions. If you go back to our Feb, 2018 review of the Money Talk Portfolio, we anticipated making $76,638 to add to our, at the time, $88,932 portfolio and, as of yesterday, we were at $135,153 - very much on track for our two-year goal. 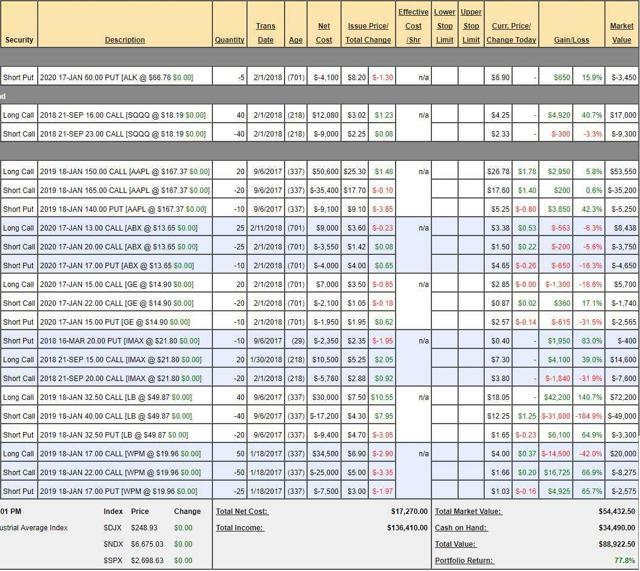 We have added a few positions but it's such a low-touch portfolio (once per quarter) that 5 of the 8 positions are still there (ABX is now GOLD) so you can go back to that review and see exactly how the trades performed vs our expectations last year. KNOWING what you are expecting to make and KNOWING what you expect to lose helps you make better hedging decisions and BALANCE is the key to being consistently successful in the market. Disclosure: I am/we are long SQQQ, TZA, AAPL, CAT, IBM, GIS, GOLD, LB, MJ, MU, WPM, ALK. I wrote this article myself, and it expresses my own opinions. I am not receiving compensation for it. I have no business relationship with any company whose stock is mentioned in this article. Additional disclosure: Positions as indicated but subject to RAPIDLY change (currently mainly cash and an otherwise slightly bullish mix of long and short positions - see previous posts for other trade ideas).